Providing you the best range of tool post grinders, machine tool spindle and cartridge spindle with effective & timely delivery. With the active support of our team of experts, we are engaged in offering a huge gamut of Tool Post Grinders. This Tool Post Grinders are a low cost solution to almost any grinding application. These high Precision Tool Post Grinders achieve very good reputation for quality and dependability in wide variety. It will turn a standard lathe into a versatile accurate, Internal, External or Deep Hole Grinder. 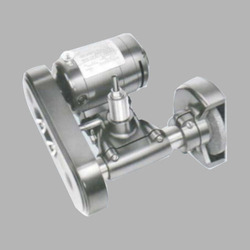 These are available in Belt Driven, Integrated Motor or with High Frequency motor. Variable RPM can be achieved with stepped pulleys or frequency drive to get high surface finish and low vibration. These Tool Post Grinders can be mounted on Machines. Normal lathes, Heavy Duty Lathe, Planers, Milling, and Universal Grinders. While placing order, please ensure to select the appropriate spindle, as per the job configuration. Interchangeable Spindles will offer the most versatile solution for every type of grinding application. Special brackets as per machine for mounting different spindles are also supplied on request. Heavy duty spindles are fitted with 2 Pairs Super Precision Angular Contact bearings of P4 class accuracy & Light duty spindles are with 1 pair only. 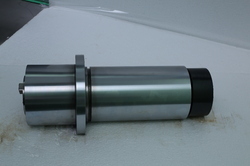 All parts hard & ground dynamically balanced accuracy with 0.002 mm on spindle shaft. Grease lubrication for long life. We are engaged in offering a wide range of Machine Tool Spindle. These spindles are driven by a tangential belt system and used widely in milling applications. They are available in various sizes with a wide variety of speed and power range. The belt-driven milling spindles with their design flexibility, diversity, and performance are suitable for a wide range of milling applications. Its main purpose is to make the machined surface flat, angular or curved or can be milled to any combination of shapes. The milling spindle helps in rotating the cutter, and feeding it. Milling spindles are available with or without power draw-bar for machine tools. Guaranteed concentrically accuracy within 0.002 mm (2 microns). All Spindles are dynamically balanced. Variable RPM can be achieved by using stepped pulley or change of pulley. They are ideal for moderate to heavy combined radial and thrust loading associated with milling cutters. The spindles are arranged for air purging both front and rear. They are arranged with milling taper as the tool interface. Automatic Tool clamping system can also be provided on request. 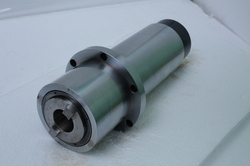 We are engaged in offering a wide range of Cartridge Spindle. These spindles are driven by a tangential belt system and used widely in milling applications. They are available in various sizes with a wide variety of speed and power range. The belt-driven milling spindles with their design flexibility, diversity, and performance are suitable for a wide range of milling applications. Its main purpose is to make the machined surface flat, angular or curved or can be milled to any combination of shapes. The milling spindle helps in rotating the cutter, and feeding it. Milling spindles are available with or without power draw-bar for machine tools. Looking for Tool Post Grinders ?